← 1shot #180-STOP, i love you! 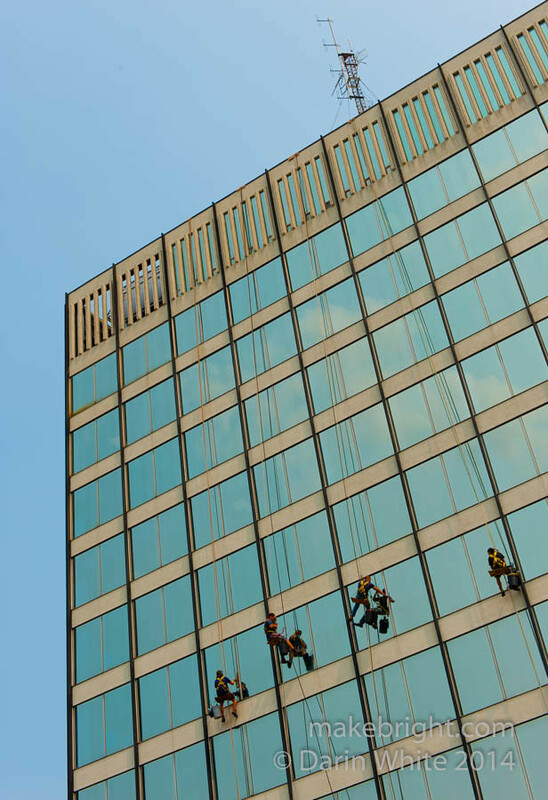 Wandering into DTK for a late lunch on Thursday, I caught these window washers on the side of 305 King. It struck me as a more pragmatic edition of my BANDALOOP shoot at CITS last year. When I squint my eyes, I imagine these guys in a swashbuckling battle with their mirror reflections. Earlier that morning, Meg Leslie and I met up with Craig Beattie at 305 to talk about potential spaces for the next Flirting with the Arts (thanks Craig!) Meg asked if I would do a photography workshop, so I’m looking at contributing a smartphone macro photography class. I’m looking for a line on the plastic lenses found in disposable cameras so any help appreciated. A cursory search of dealextreme and aliexpress only turned up $2+ lenses which I’ve not tried and which seem like overkill. Looking forward to sharing some photo fun. This entry was posted in photography and tagged 1shot, King Street, window. Bookmark the permalink.